Fearless Females #10 Religion: Catholic branches in my ancestry. 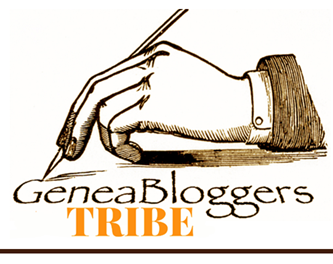 Lisa Alzo of The Accidental Genealogist blog presents Fearless Females: 31 Blogging Prompts to Celebrate Women’s History Month #10: What role did religion play in your family? How did your female ancestors practice their faith? If they did not, why didn’t they? Did you have any female ancestors who served their churches in some capacity? Religion played a pivotal role in my family and that of many of my ancestors. Unfortunately sometimes it was a divisive influence in situations where there were mixed marriages (Catholic+Other), or where adult “children” left the church causing separation from siblings or parents. As my family history research has taught me more about my families’ long term religious affiliations, I’ve often found it ironic that my “Catholic branch” actually has a mixed Methodist/Baptist and Catholic ancestry while my nominally “non-Catholic branch” was Catholic through-and-through for generations. Life’s little paradoxes. 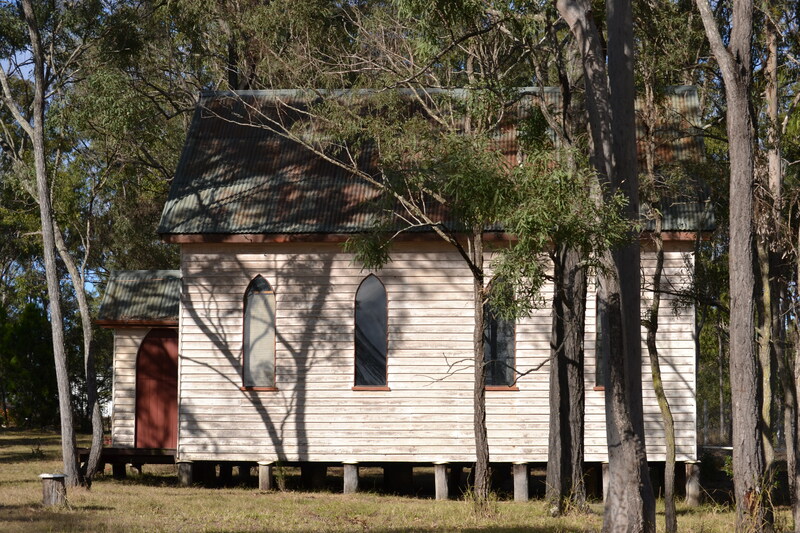 The old decommissioned church from Murphys Creek now on a rural block at Upper Laidley. Photo copyright P Cass 2011. I’ll talk a little about the Catholic branches of my family as I’ve found out more about them, and have a better understanding myself. In the early days of Queensland there were no churches and much depended on gaining the support of the community, Catholic and non-Catholic, to build new churches for the community. My family members were among those who subscribedto these collections to ensure that they could practice their faith in a place of worship. Before churches were built however, they were also said to be among those who had the Mass celebrated in their own home. This oral history was known in Ireland, even 150 years later, which is quite astonishing. I wonder if they tired of funding one church after the other, as they moved to progressively more rural areas. Thanks to the local historian I learned that the little Catholic church which was built at Murphys Creek (no doubt with the aid of money from the Kunkels), is now a home library on a private block of land not too far away. While there’s quite a lot in the papers about its consecration at the time, I’ve not found a subscription list. 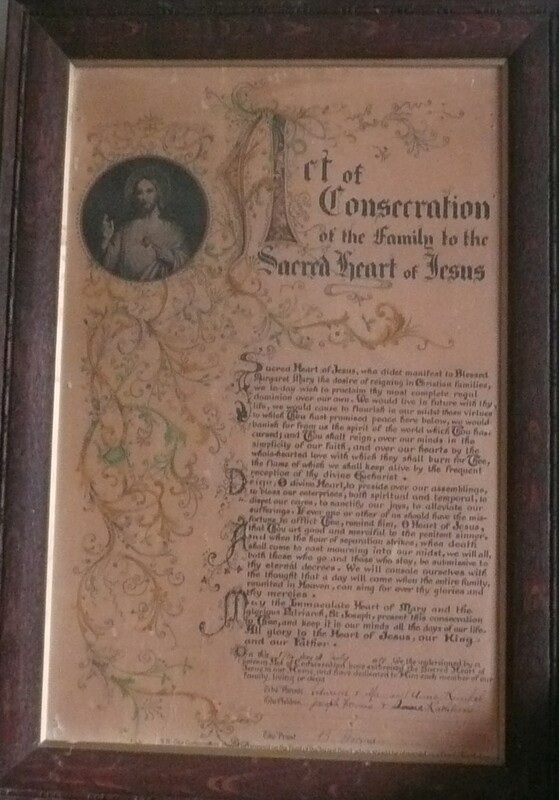 Consecration of the family to the Sacred Heart: this would have hung in the farmhouse owned by the original Australian Kunkel family. Father Dunne (later Bishop), who is known to have said Mass in bush homes around Toowoomba where my Kunkel ancestors lived, believed firmly that “in every country, and in every age, the farming districts were the chief abode of Faith, the choicest dwelling place of virtue”. He knew those agricultural areas around Toowoomba “to be studded over with pure and beautiful homes, as is heaven studded over with its silvery stars. In those homes the parents teach their children goodness, and the children repay by their innocence the parent’s care a hundredfold”. I like this quote and the imagery it provides of parents bringing up their children in faith despite their distance from regular worship. Nonetheless I suspect Dunne was also prone to romanticising the rural lifestyle, glossing over the level of sheer hard work involved. Catholic homes and families would be blessed and dedicated to the Sacred Heart of Jesus. Very recently I’ve been given one of these Consecration “posters” which hung in my Kunkel ancestors’ first home, possibly when it was rededicated after my 2xgreat grandmother’s death. 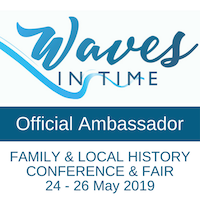 Although I have no firm evidence for my view, I believe that it was probably my women ancestors who ensured the faith was carried forward, by teaching the children their prayers and taking them along to Mass when it was held. In those early pioneering days Mass was far from a weekly event but when the priest arrived on horseback, the faithful would gather together to celebrate: shepherds, stockmen, railway workers, wives and children. 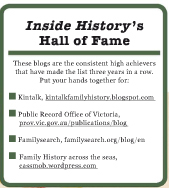 My Catholic ancestry includes the following names: Kunkel, O’Brien, Gavin, McSherry/Sherry/McSharry. My Methodist and Presybterian families remain under-researched, waiting for me to have discretionary time to follow them up in Queensland. One day! My non-Catholic families are Melvin, Partridge, McCorkindale, Kent. Published in the Catholic newspaper of the time, The Australian, 1 March 1884.